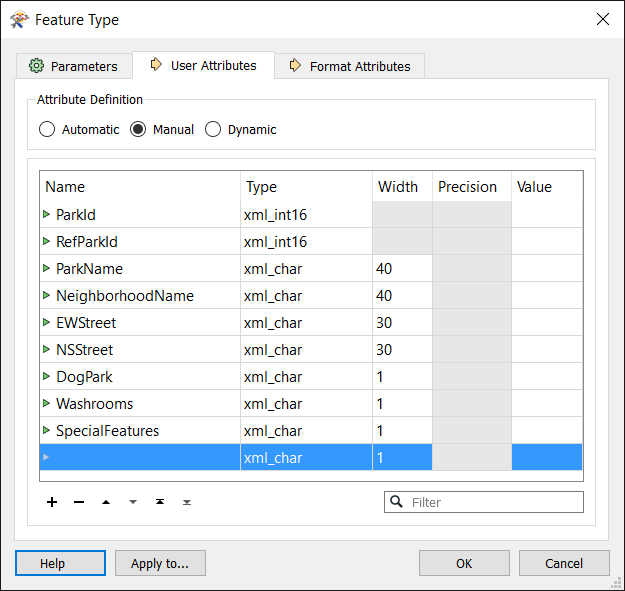 Enter the name of the attribute and use the tab key to move through the Data Type, Width and Precision fields. You can enter or change the default values provided in these fields, or continue to enter more attribute names. Connect the attribute with its source. Note: To quickly rename an attribute without reopening the dialog, float the cursor over an attribute name (you will see a highlight), right-click and select Rename. Select the Destination Feature Type, right-click and select either Copy Attributes From Feature Type… or Copy Attributes From Transformer. In the dialog that appears, select either a feature type or a transformer from the pull-down list. All the attributes will be copied to the selected feature type. Tip: Use the Attribute Connection feature to quickly connect reader and writer feature type attributes. To open the Attribute Connections pane in Workbench, select View > Windows > Attribute Connections.